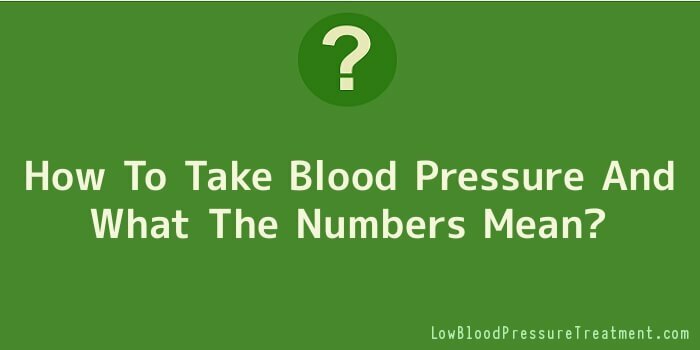 How to take blood pressure and what the numbers mean. The blood in your body pushes out on the blood vessels that contain it. This push creates pressure, your blood pressure. The greater the push, the higher will be the blood pressure. Normal blood pressure is often quoted as 120 over 80. A healthy blood pressure is anything less than that which does not cause symptoms, while high blood pressure is anything over that, with 140/90 often quoted as the boundary of worryingly high blood pressure that needs treatment. But what do these numbers mean? The blood in your body pushes out on the blood vessels that contain it. This push creates pressure, your blood pressure. The greater the push the higher will be the blood pressure. The top (or larger) number is the systolic pressure. This is the maximum pressure your circulatory system is under, and occurs during the contraction of your heart. You heart contracts, blood is forced out into the aorta, and the pressure in the aorta rises as the volume of blood passing through it increases. The bottom (or lower) number is the diastolic pressure which is the pressure your arteries are under between heart beats. The diastolic pressure is caused by resistance in the smaller arteries and capillaries to the flow of blood through them. If resistance is high, diastolic pressure increases. Traditionally, your doctor would take your blood pressure using a stethoscope and mercury sphygmomanometer. However, things have moved on and a new breed of home monitors makes quick and reliable blood pressure monitoring something anyone can do in the comfort of their own home. Digital home monitors work using the same principles as traditional methods. You apply a cuff around your upper arm, at the same level as your heart (there are monitors that go around your wrist, but I personally have found them to be less reliable). The monitor inflates the cuff to a level that stops the blood passing through the brachial artery in your arm. The cuff then slowly deflates, monitoring the blood pressure until blood just starts to flow through the artery again. This point is your systolic pressure. If your doctor is measuring your pressure with a stethoscope, they will be hearing a faint tapping sound at this point. The cuff continues to deflate slowly until if offers no resistance to blood flowing through the brachial artery. This point marks your diastolic pressure. If your doctor is listening through the stethoscope, they mark this point when the tapping sound completely disappears, and instead can hear a whooshing sound as blood flow returns to normal. You should be aware that blood pressure changes throughout the day, and with your emotional state. If you are monitoring at home, try to check your blood pressure at the same time of the day. Here are some other guidelines: It is important that you are completely relaxed when you measure your blood pressure. Don’t drink caffeine drinks for at least an hour before taking a reading. Don’t smoke for at least an hour before. Sit quietly for five minutes with your feet flat on the floor, and back supported. When taking the reading, keep your arm supported at heart height. If rolling up your sleeve causes a pressure on your upper arm, remove your top while you take the measurement. Take two readings two or three minutes apart, and find the average.